The 1973 Eleanor was a movie car from the independent filmmaker H.B. "Toby" Halicki's 1974 film Gone in 60 Seconds. It was actually a 1971 Mustang in 1973 Mach 1 trim. 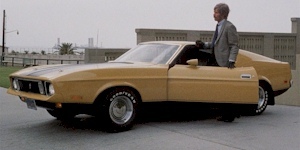 Two Eleanor cars were used in the movie, a "beauty" version for close-up shots, and a stunt version used for the high speed chase scene. The high speed chase scene is considered one of the best movie car-chase scenes of all time. Another is the the movie "Bullitt" which featured a 1968 Mustang! This is the yellow 1973 Mustang from the original Eleanor from the independent filmmaker H.B. "Toby" Halicki's 1974 film Gone in 60 Seconds. There were actually two Mustangs used in the film. One, this one was the "beauty" version which was used for up-close detail shots. The other was the "stunt" version which was fitted with a full roll cage along with many other safety and suspension modifications. The cars where really 1971 Mustangs fitted with 1973 trim. In the film, the main character stole 48 high end valuable cars in just days for a client. The most infamous would be this 1973 Mustang "Last of the Mustangs". It was considered important as it was the last of the Mustangs because the Mustang II arrives in 1974. That's Toby Halicki in the photo as he was the main character in the movie. This car is said to have been crushed after the movie according to Toby.